Doctor fined for injecting fake Botox in his med spa. 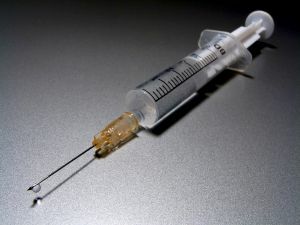 Some doc named Halliday in East Syracuse NY injected fake Botox into twelve of his patients and has now received a $20,000 find as put on probation for three years. He's also restricted to practicing medicine only when monitored by another doctor who periodically reviews his records. Nice. Halliday is an ear, nose and throat doctor who practices at 4939 Brittonfield Parkway. The state Board for Professional Medical Conduct charged Halliday with 10 counts of professional misconduct including gross negligence, gross incompetence, negligence on more than one occasion and incompetence on more than one occasion. In a signed consent agreement, Halliday pleaded no contest to two negligence allegations that he failed to advise a patient of her treatment options and failed to obtain an adequate pre-operative history from another patient. The no-contest plea satisfied all the charges against him. The uncontested charges relate to the absence of documentation, said Charles Patton, Halliday's attorney. "In consultation with me, Dr. Halliday considered the cost and time away from his patients, which defending himself against these allegations in a lengthy proceeding would require," Patton said. "He has elected to resolve this issue by consent agreement so that he might focus his attention entirely upon patient care." In its statement of charges against Halliday, the board said he injected 12 patients in June 2004 with unapproved botulinum neurotoxin. That drug is made from the same highly potent toxin that can cause botulism, a severe form of foodborne illness. A purified version of the toxin is used to treat wrinkles. It affects the ability of muscles to contract, smoothing out frown lines to make them nearly invisible. Botox is the only type of botulinum toxin approved by the U.S. Food and Drug Administration. The board said the version Halliday used was labeled, "For Research Purposes Only -- Not For Human Use." In June 2005, Halliday wrote to the 12 patients and informed them the drug they received was unapproved and he was unaware of any patients who experienced harmful effects from it, according to the board. Halliday ordered the botulinum neurotoxin from Toxin Research Inc., the board said. That Tuczon, Ariz., company sold the cheaper, unapproved Botox substitute to more than 200 doctors nationwide, according to the FDA. Chad Livdahl and Zarah Karim, owners of the company, were convicted of fraud and misbranding a drug and sentenced to prison in 2006. Toxin Research Inc. sold the product to doctors from Manhattan to Las Vegas who learned about the drug at conferences put on by the company, according to the FDA.